As an apologist, let me encourage you to trust in the power of the gospel. Do not be ashamed to freely speak about the goodness of God’s mercy and kindness. I have said before that most people reject God because of emotional and volitional issues. Intellect merely hides these issues. Though we talk about evidence and logic and arguments, apologists must remember that the reason many people will not submit to God is their heart. But the loving-kindness of God’s grace can soften a hardened heart and will draw many to Him. All people recognize two things: there is a God and they have broken a standard of morality for which they should be judged (Rom. 1:18–2:16). All people struggle with guilt, and guilt is a powerful force that causes many people to run from God rather than to Him. Guilt often manifests itself in pride and the attempt to either rationalize sin or personally atone for it. Guilt sometimes results in depression, feelings of inadequacy, and the belief that no one should love them. Whatever it looks like, guilt is an obstacle to repentance. But God is greater than our sin. His love is more powerful than our guilt. And His kindness will draw many to repentance. Don’t place your hope in logic, history, science, and argumentation. Trust in the beauty of the gospel and God’s mercy. Do not be ashamed of the gospel because it is the power of God for salvation (Rom. 1:16). Share it as often as you can. The most overlooked part of apologetics is the gospel. Apologists tend never to get that far in conversations with nonbelievers. We sometimes think that people won’t believe in the foolishness of the cross. So we resort to talking only about that which seems reasonable. But do not shy away from preaching what this world will consider foolish. 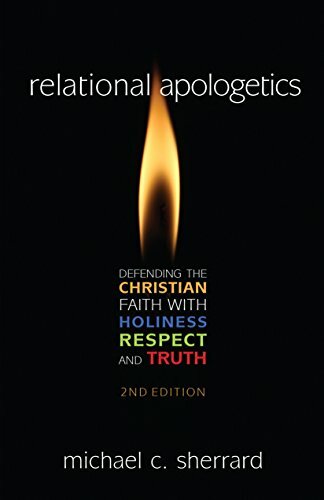 Remember that apologetics is a servant of the gospel, and sometimes the servant just needs to get out of the master’s way. Apologists, share the gospel with others, and tell them how God’s grace has transformed you. You can offer the hope of a changed life. Tell your story. Explain what it’s like to be forgiven. Talk about your anticipation of heaven. And joyfully speak about the peace of God that now fills your life. Invite skeptics to meet God and enjoy all that comes from life in Christ. Feel the freedom to tell them you know Him, that you’ve experienced Him, and they can too. There is value in your experience and personal knowledge of God. Talk about it. Some people say that you cannot argue with a changed life, but you can; I argue with the good and changed Mormons all the time. But there is value in your conversion, in the reality that God can be known and experienced. So tell people your story and invite them to enter into one for themselves. Michael C. Sherrard is a pastor, author of Relational Apologetics, and the Director of Ratio Christi College Prep. RCCP is an organization that seeks to equip the church for effective evangelism by teaching high school students apologetics, fundamental Christian doctrine, and biblical evangelism.